Always productive and very interactive. She listens, knows my situation, and makes sound, useful recommendations. I trust her implicitly. My first visit was great . She got right to the issues and explained my possible problems and course of actionsvery clearly. I am looking forward to my next visit for the outcome of my test and a possible solution. My first visit was great . She got right to the issues and explained my possible problems and course of actions very clearly. I am looking forward to my next visitfor the outcome of my test and a possible solution. 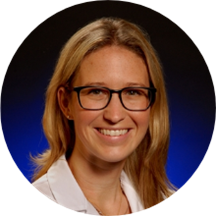 Dr. Allison Fillar is a mindful and concerned orthopedic surgeon and sports medicine specialist serving the communities of Lutherville and Baltimore, MD. Dr. Fillar attended George Washington University, where she received her medical degree. She then completed her residency in orthopedic surgery at the Albert Einstein College of Medicine of Yeshiva University, Montefiore Medical Center. She continued her training by completing a fellowship in orthopedics and sports medicine surgery at Medstar Union Memorial Hospital and Medstar Washington Hospital Center. She also holds a master’s degree in forensic sciences and a bachelor’s degree from George Washington University. Dr. Fillar is a part of Medstar Orthopaedics and is affiliated with MedStar Union Memorial Hospital in Baltimore, MD. During her consultations, Dr. Fillar fully explains patients’ conditions and helps them choose an appropriate treatment plan. Dr. Fillar is devoted to ensuring the longevity of her patients’ health and developing long-lasting relationships with them. She takes her time to understand symptoms and give correct diagnoses to ensure the continued health of all her patients. Great orthopedist! Extremely knowledgeable. Listens intently to the description of your aches and pains. Very professional but down to earth. Would recommend her to anyone on the planet! Dr. Fillar is very nice and explained everything very well. Fastest doctor visit ever and even had x-rays done! Very good professional demeanor, very personable person. I'd recommend her to anyone that needs orthopedic help. Always a pleasure. Dr Fillar is never pushy or dogmatic and we always have useful and prodcuctive discussions of next steps, my problems, etc. Very thorough. Professional and caring manner. Listened to my concerns. Really great doctor. Very personable! Would highly recommend her. Best bedside manner. Pleasure to talk to. Dr. Fillar was very professional and personable. She listened to my concerns and provided me with a thorough explanation of my condition and the available treatment options. I highly recommend her! I was put at ease and asked my opinion. This is important when meeting someone who will be responsible for your health. Dr. Fillar is very approachable and has an easy going style bringing in a little humor to lighten the mood. She had a serious focus on my injury history and understanding of my current health situation. She evaluated my knee andX-rays then explained potential treatment options. Even as an orthopedic surgeon, she wasn't recommending surgery as the first option. Everyone at the office (receptionist, nurse, X-ray tech) was really great and pleasant. Overall, it was a great experience. Very professional, friendly, and helpful staff. Great beside manner. Will return for more evaluations. Very helpful and good advice. Would definitely recommend. I highly recommend Dr.Fillar when seeking medical treatment for orthopedic issues. She was personable, profession and provided option along with recommendations on the best course of treatment which worked effectively. She is Awesome!!! Down to Earth.easy to talk to,and Super Smart! I love Her! Loved her. Staff was friendly and welcoming. No wait time for Dr. Dollar. I have been seeing Dr. Fillar for chronic knee issues. She has operated on me twice and I trust her 100%. She is a compassionate, caring and competent physician and I would refer her to my friends and family and anyone else that wants a great doctor!!! I always feel like Dr. Fillar and her staff take excellent care of me. Dr. Fillar is caring, kind and I know that she truly has my best interest at heart. She wants me to feel the best I can feeland will do everything she can to help me. I always have positive experiences with her and at her office. Dr. Fillar"s visit was just as I expected. She and her staff are efficient, organized, and professional. It's worth the drive from Columbia! Oh My God. Drs. Fillar and Neary were awesome! Knowlwdgable, caring and very down to Earth. I cannot say enough about them both. Also the X-ray Tech (I did not get Her name) was great as well. Dr. Fillar asked probing questions, listened carefully to the responses then restated our conversation to make sure we were in sync. She provided numerous options and helped me to select one that was optimal for me. I left with a definedstrategy, clear next steps and knowledge of future options should next steps be required. I wish I had gone to Dr. Fillar first. Previously, I was seeing a podiatrist, but I felt like I wasn't getting the right diagnosis or proper treatments. I tried to make suggestions and ask questions but my ideas and concernswere dismissed, so I decided to get a second opinion. Dr. Fillar listened to my concerns and agreed that previous diagnosis and treatments were incorrect. Now I'm finally getting the proper treatment, thanks to Dr.Fillar and her team.